Rishabh Tagore is a junior in the College of Arts and Sciences majoring in Economics with interests in human rights, development, business and technology. 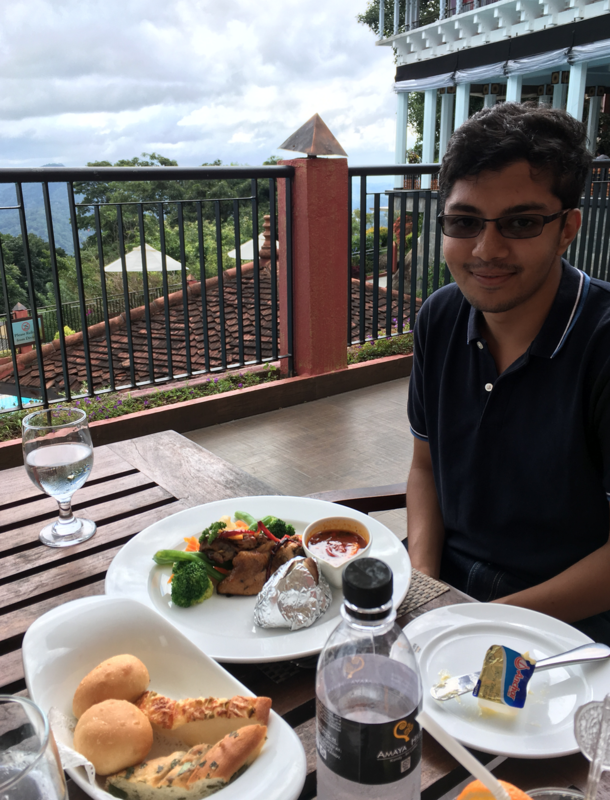 Thanks to a generous grant from Rajiv Kanishka De Silva, Rishabh was able to join the SAC Summer Research Internship Program in Kandy, Sri Lanka. Here is what Rishabh had to say about his experience working with the International Centre for Ethnic Studies (ICES). "In Indran Amirthanayagam’s poem "Words for the Sri Lanka Tourist Office", he composes a lucid picture of the nation, from the "the King Cobra [that] slides through our jungles" to the "patrol boats in the Bay or stilt-fish off Matara down South". It surprised me, when I first began learning about Sri Lanka, how an island so small could give rise to such complex mosaic of politics, ethnicity, geography, and history. While I was in Sri Lanka, I developed a deeper understanding of how this mosaic comes together – not completely, and certainly not in full measure – but quite substantially. The International Center for Ethnic Studies (ICES) gave me a vibrant community to engage in my exploration. My internship began weeks before I actually arrived in Sri Lanka. After a Skype meeting with my supervisor from ICES, I had a sense of the kind of problems I would be tackling, which allowed me to begin my research. I read everything from Sri Lankan short stories to poetry and many primers on its history. I also knew that my research would likely be centered around economic development, which allowed me to immerse myself in the fascinating literature of that field, especially as it relates to post-conflict societies. Little did I know that I would later meet many of the people whose work I read. The first project I worked on was a collaboration between the World Bank and the ICES, where I helped to conduct a strategic social assessment of the Northern and Eastern provinces and identify opportunities for future investment. I helped organize stakeholder meetings with journalists, labourers, academics and civil servants in all of the eight war-affected districts of the country, taking me on a whirlwind journey through the nation. From these meetings, I most vividly remember the stories – some of struggle and sufferings, but others of hope and optimism. Some moments were heavier – with tales of houses being brought to their knees by rioting crowds, while others were lighter – such as when a fisherman cracked a particularly amusing joke at the expense of a senior civil servant. Most of all, I learned that wars do not end when the final bullet leaves the barrel, their effects can persist for years afterwards and require sustained effort and intervention. Based on my work with the World Bank, I realized that technology could be a fruitful enabler of Sri Lanka’s economic development. My second project examined both the potential and pitfalls of technology’s role in Sri Lanka’s economy. I worked extensively with the Lankan Angel network – a network of investors who help fund start-ups – which exposed me to the next generation of Sri Lankan entrepreneurs. I also helped host Sri Lanka’s largest startup conference, called Disrupt Asia, where I got to meet and learn from the the titans of the country’s business community. At the same time, I also traveled to the the bicycle-laced streets of Jaffna in the north, where I visited coding bootcamps and startup accelerators helping to plant the seeds of entrepreneurism in areas that were most affected by the war. Ultimately, I found that technology could be a promising force for progress, but also a harbinger of economic inequality. Effectively managing technological development will be essential if Sri Lanka wants to continue on the pathway of sustainable development. Sri Lanka is a hidden pearl in the Indian Ocean. Despite its small size, the story of Sri Lanka has lessons for other deeply divided places, who struggle with the complexities of language, culture and ethnicity. Just as importantly, Sri Lanka is becoming an increasingly important player in geopolitics, as China and India compete for power in the region. Therefore, understanding Sri Lanka has been critical to my intellectual development. However, it is the friendships and stories that I will most treasure from my time in Sri Lanka – those are things I will never forget."